Love this! Yep it happens. The kids don’t need us to bribe them to take the medicine anymore. Medicine taking is no longer an event, just a thing. But just wait, she’ll need you now in even more beautiful ways. Man, she not only doesn’t need to be bribed, but is a totally independent medicine taker. But she still needs to be tucked in to go to sleep, so I feel necessary. Thanks for the comment and for reading! Oh wow, I completely felt every thing that you wrote! And good for her. I was also kind of relieved when my daughter first took a capsule antibiotic. She was only 5 and had pneumonia. I thought she was going to choke. I was scared to death. She downed it no problem with a big smile said “its gone mom”! I thought awesome, she won’t be one of those weirdos who can’t swallow a pill! Haha, I know a lot of them, even related to some 😂. We also have a drawer full of forgotten medicine syringes and liquid medicine cups. It’s bittersweet how these milestones come and go. I have one who is a great medicine taker (My younger one ). She’s on multiple meds and an inhaler, though. She’s used to it. My 13 year old… let’s just say I’m glad she doesn’t get sick often. Getting meds into her is a chore. I’m glad I’m not the only crazy mama with drawers full of such things. 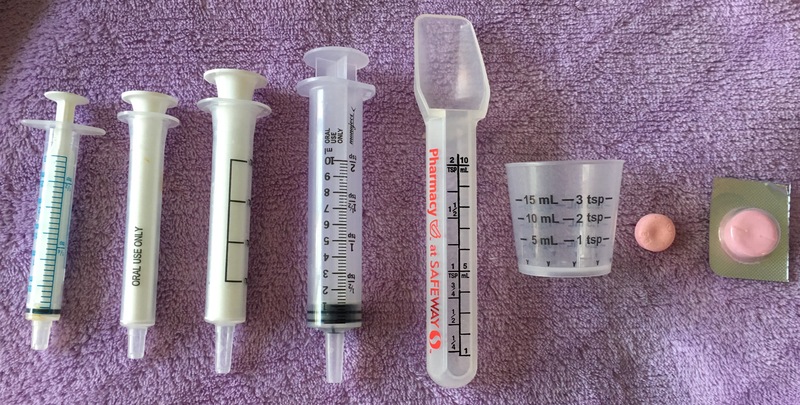 After this blog post I did throw most away, keep a few, and put others into the play doctor kit. My kiddo has always been decent at taking medicines, so long as you ignore the complaining before and after ingestion. ….and now I contemplate changing “scowl” to “wince”…. Ah yes. Scowl makes me think she’s worried about the extra laundry. Wince makes me think she’s worried about losing her little girls. Oh, two. I loved two. I’m one of those mommas who just made it through the infant years and finally came into my own when my kiddo could start communicating with me. The attitude of two and three were refreshing when compared to the mystery of an infant. Someday you’ll dole out big antibiotic pills, or realize your kid could wear adult size shoes and think, “How did we get here already.” Enjoy the journey! Thank you so much for your comment. So heartening- I feel the same way. I feel much more like myself as a mother of a kid with words than I did with, as you so aptly put it, the mystery of an infant. Thank god I’m not the only one who feels this way! Ack! Sent too early! Any whoo…. if children were born with the intellect of an 18 month old I’d have 6 kids, but I only have one. (Okay, I may have also been scarred by potty training.) So hooray! You are normal! Me too!